Even though we live in the most affluent country in the world, where most people earn and spend a fortune in the course of their working lifetimes, why is it that the majority ends up dependent on social security, pensions and relatives when they retire? If a person earning $25,000 dollars per years would just save $2500 dollars per year, ten percent of his income, and invest it carefully to earn a return of ten percent compounded over the course of his working lifetime, the years from age 21 to age 65 (44 years), it would grow to $1,794,762 dollars through the miracle of compound interest. So the question I began to ask was “why is it that people don’t become wealthy?”. In a country like ours, with the opportunities that we have, why is it that so few people retire financially independent? And I eventually found the answers. 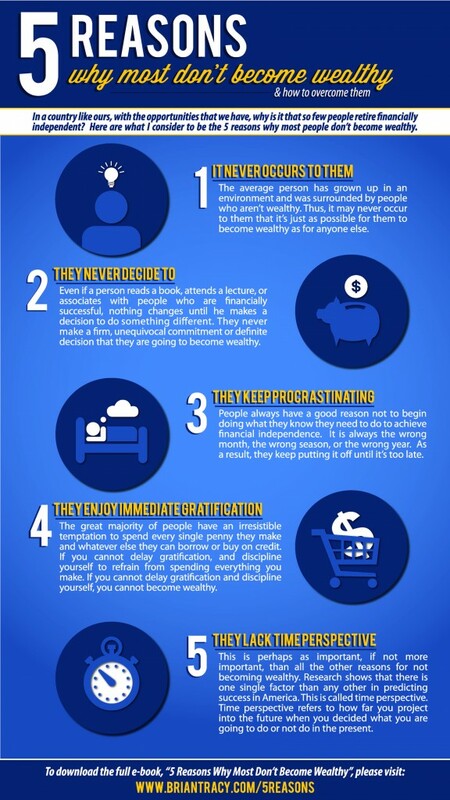 The infographic below exhibits what I consider to be the five reasons why people don’t become wealthy. Enjoy!